A cute coffee jar terrarium is a great way to bring a little nature indoors, and show your love of a good cup of joe! If you don’t already happen to have a small glass coffee jar, you can purchase one at a craft store or you could repurpose a different coffee container like a coffee pot or even a French press! These basic terrarium building rules can be applied to any container. The other items you will need can be purchased at any home improvement or gardening store. The three main components needed in a terrarium are pebbles for drainage, charcoal to clean and purify the water and soil for the plants to grow in. The most important thing to remember when making a terrarium is drainage. A container like a glass coffee jar doesn’t have a drainage hole, but you can create drainage with pebbles in the bottom of the container. Before beginning the project, make sure your glass jar is thoroughly washed and dried. Once your container is ready, add the pebbles. You’ll want a small layer, about a 1-2 inches deep. If you’re using a large container, you can add more pebbles. Sprinkle or spoon a layer of charcoal over the pebbles, about 1-2 inches thick. Add a layer of potting soil, about ½ to 1 inch deep. If using small terrarium plant(s), take them out of the container you purchased them in. Gently tease the root ball so it’s a bit loose before setting the plant in the jar, on top of the soil. Once your plants are sitting where you would like them, add potting soil around them. It’s easiest if you pre-moisten your potting soil with a bit of water before adding it to your container. Dry soil will get everywhere, but if your soil is damp or wet you will have more control. It’s easiest to spoon a little bit of soil into a plastic container, add water and stir before adding the damp soil to the jar. You can also use a spoon to add soil to the jar. Be sure to fill in all of the empty spots with soil and that the soil is level and even. If you’re using moss, you can add a couple spoonfuls of potting soil to the jar, make small depressions in the soil and set the clump(s) of moss in the depressions. Now it’s time for a decorative touch! We used a small glow-in-the-dark sun from the fairy garden section at our local gardening store. Fairy garden decor is perfect for a terrarium, though any small items can be used, a little plastic animal or another trinket just adds a little something extra! Be sure to keep the needs of your plants in mind when caring for your coffee jar terrarium. Some plants need more light than others and you may need to occasionally water them if your jar does not seal air tight. 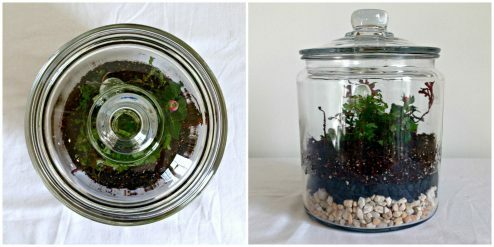 If you use our DIY instructions and make your own coffee jar terrarium, please share with us on social media! We’d love to see what you create!